On Tuesday this week, it was announced that the next season of American Idol would be the last show. The show is being cancelled after 14 years and it looks like now they are blaming the downfall of the singing competition on the disastrous paring of Nicki and Mariah on the season 14 of the show. Former AI executive producer Nigel Lythgoe is blaming Nicki and MiMi for tarnishing the brand. 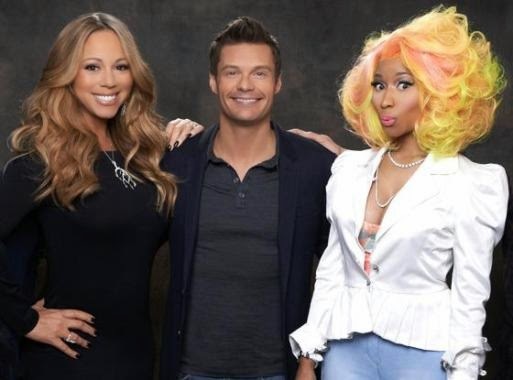 American Idol boss ‘Nasty’ Nigel Lythgoe has blamed pop divas Nicki Minaj and Mariah Carey for the demise of the talent show. The programme’s former executive producer has hit out at the casting of the two singers as judges and agrees with Fox axing the series. He said: “Mariah and Nicki was just crazy, and then it really started becoming about the judges and took away from the contestants altogether. “I think that was a major failing on the part of casting to have those two together.